Running out of time before your Apple Watch battery dies? In the future, that may not be quite so big a deal, if a patent application from Apple bears fruit. Apple's "Connector-free magnetic charger / winder", published by the U.S Patent and Trademark Office, describes a system which would see turns of a smartwatch's digital crown converted into energy. It's a system that takes its cues from the world of mechanical watches, with a rotational magnetic field either moving an electric generator producing power for an internal battery, or winding a spring or coil to exert force on gears that produce energy in a system similar to traditional watches. 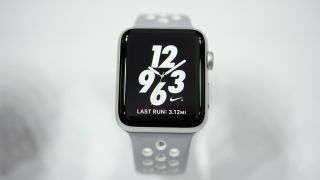 Apple's current Watch line-up uses the crown to navigate its operating system, making use of light signals rather than the gears which used to be inherent to mechanical watches. But the system described here could be adapted to support both navigation and power generation. The patent also describes how a similar system could be used to power smartphones or tablets, though notes that the winder would have to adapt its "angular velocity" between iPad and iPhone set-ups in order to generate substantial energy. It's not the first time Apple's explored the area it would seem, with the filing acting as a continuation of an earlier patent. The coil component driving the power generator seems the part Apple is most keen to protect with this latest filing. As with all patent applications, there's no guarantee that this idea will ever go beyond the blueprint stage. Charging a tablet or phone this way seems particularly far fetched. However, if Apple could harness the idea in a way that would help stave off the full depletion of a battery at critical times (say during a long marathon run) with a few well timed turns, it'd be a great USP for Apple's smartwatch line up.